﻿ Wooden House Design With Idyllic Landscape! The Idyllic Place To Have a Relaxing Time! A wooden house design with a nice, natural and relaxing retreat. In sync with the surrounding outdoors, the Forest House by Envelope A+D this epitome of a family retreat establishes what is like to have quality family time. SHINE SOME DESIGN ON: LIGHT UP: MEET THE UNIQUE CONTEMPORARY LIGHTING FIXTURE! Nestled among the tall trees of the Northern California, the house fits so well into the surrounding forest hill area that it’s difficult not to be amazed by it. Perfect for some family vacation where you can explore all day and give unique experiences for everyone this modern home design blends perfectly with the landscape. The architecture studio wanted to bring some modern design into this wooden cabin design. With that in mind, the nine spaces of the house are connected to each other and to the surrounding landscape. A welcoming retreat for everyone who visits to have a fresh new perspective. To build this Forest House, traditional and modern joined forces. While having a treehouse feel, the contemporary home style is clearly seeable in the clean lines and full shaped format of the house. With a detached structure, it houses the kitchen and living room. With astounding outdoor area, this connects the two. The other cabins contain a guest suite, private sleeping arrangements and bathroom that have a special feature: if you are travelling with children, these ones are equipped for them since one of them has individual bunks built within the wooden walls. One of the main aspects of having a treehouse is to experience nature. The forest and the fresh air and the unique experience of being in nature are one of a kind. In the summertime, when everything is hopeful and spring has already taken its course, in this home, the sliding doors open up to bring the fresh air needed. The transparent walls flood the rooms with natural light. On one side, the woodland becomes the house’s garden. On the other, the rooms become a part of the natural landscape. The contemporary lighting we bring today to shine some light on your day is … Pastorius! An industrial chic style and features swing arms that are an American classic. Sophisticated and modern, Pastorius arm lamp complements any interior design. Its extendable arm built of brass can be adjusted into different positions and extends up to 26”. The handle made of steel with a matte black finishing gives you the possibility to adjust the lamp shade upwards or downwards. Take this contemporary wooden house as an example and bring the best that nature has to offer into your home! 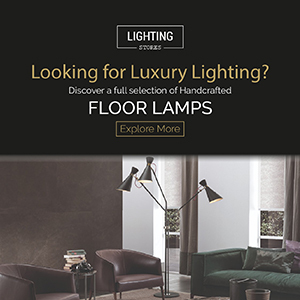 Don’t forget to tell us what lighting news you brought to your decor! Treat Yourself by Seeing This Contemporary Rural Retreat!